I practice psychotherapy as a means of expressing love and caring. During the process of counseling, I form a trusting partnership with my clients. I am inspired by my clients' abilities to seek help, gain insight, feel deeply, and change profoundly. Together, we celebrate as they regain joy, find contentment through release of worry, and live fully in the present. My training in family systems helps us identify and change maladaptive patterns in your current life. My approach is based in family systems, supported by ideas and techniques from humanistic and transpersonal psychology, including studies of shamanism, enriched by the use of metaphor and creativity, strengthened by neurological reprocessing methods for trauma and biofeedback. I work closely with a naturopath to improve how people feel, think, and behave, using diet changes as well as supplements for neurotransmitter deficiencies, depression, and anxiety. During my career as a professional artist/educator, I decided to develop my talent for psychological healing. I earned a masters degree in psychology, with an emphasis on family systems. A graduate certificate in creativity "married" my two loves, art and psychology, and this relationship deepened during my doctoral studies in humanistic and transpersonal psychology. I later studied pain management at the Mayo Clinic in Rochester, MN, and neurological trauma reprocessing (EMDR). 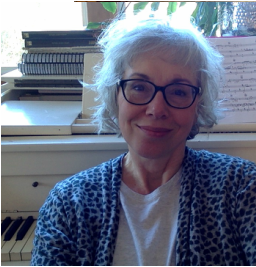 I continue to study trauma treatment, naturopathic methods of alleviating depression and anxiety, as well as jazz vocals. My work as a psychotherapist is a natural extension of my research and artistic creativity. I bring my ability to focus and concentrate for extended periods of time to our meetings. I am comfortable with intuition, reflection, incubation of ideas and possibilities. I enter deeply into creative flow while working with clients, understand of the importance of rhythm, pacing, and timing, and use creative processes to facilitate client transformation. I am from an immigrant family, Moravian Czechs, and I enjoy working with clients from many countries, regions, ethnic groups, social classes, and sexual orientations. In 2015, I celebrated my 60th birthday! Amazing. Decades of meaningful life experience provided a kind of wisdom that is not taught in any school. 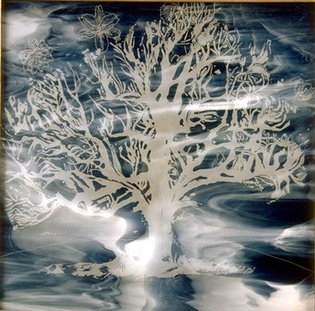 A Tree in Winter Remembers Spring, Denita Benyshek, engraved glass, Ethnic Heritage Collection, Harborview, Medical Center, Seattle, WA. Ph.D. Humanistic and Transpersonal Psychology, Saybrook University, San Francisco, CA. EMDR (Eye Movement and Desensitization Therapy) I and II. Graduate Certificate in the Psychology of Creativity, Saybrook University. Structure and Dynamics of the Family. M.F.A. Painting, University of Washington, Seattle, WA. B.F.A. Painting, Wichita State University, KS. Olympia, WA Art in Public Places Program (deaccessioned due to vandalism). Benyshek, D. (2016 in press). The artist as shaman: Accessing higher powers through different states of consciousness in service of community. ReVision, a Journal of Consciousness and Transformation, 34. Benyshek, D. (2015). Artists as Shamans: Historical Review and Recent Theoretical Model. E. E. Djaltchinova-Malec (Ed. ), Shamanhood and Art: Traditional and Contemporary Arts, Artists, and Shamans, Akadémiai Kiadó, Budapest, Hungary, Polish Institute of World Art Studies, Warsaw, and Tako Publishing House, Toruń, Poland, pp. 211-240. Benyshek, D. (2013). Art audience as shamanic community: How art meets psychological, social, and spiritual needs (Wang, Trans.). In G. Shuyun, W. Weibo, & Q. Fang (Eds. ), Modern artists and shamanism (Vol. II). Beijing: 商務印書館 (The Commercial Press). English text is available online. Benyshek, D. (2013). An Overview of Western Ideas regarding the Artist as Shaman (Wang, Trans.). In G. Shuyun, W. Weibo, & Q. Fang (Eds. ), Modern artists and shamanism (Vol. II). Beijing: 商務印書館 (The Commercial Press). Benyshek, D. M. (2011). The flapping butterfly wings of gifted mentorship: Ruth Richards and Saybrook University. NeuroQuantology: An Interdisciplinary Journal of Neuroscience and Physics, 9(3), 535-544. Benyshek, D. (2013). Shamanistic arts benefit audience healing, growth, and social change. R. Richards (Chair), Art as healer: Preschoolers to seniors to society at large. American Psychological Association Annual Conference, Division 32: Society for Humanistic Psychology, Honolulu, HI. Benyshek, D. (2011). Exploring Artists as Shamans: A Critical and Historical Overview. The 10th Conference of the International Society of Shamanistic Research: Shamanism and its Arts. State Ethnographic Museum, Warsaw, Poland. Benyshek, D. (2009). Artist as shaman: Academic performance art. Shamanism in the 21st Century Conference, Shamanism and Alternate Modes of Healing, San Rafael, CA. Benyshek, D. (2009). The Contemporary Artist as Shaman, The 9th Conference of the International Society for Shamanistic Research, University of Alaska, Anchorage. Benyshek, D. (2009). Creative Opportunity within Creative Block, Creativity Studies Department, Saybrook Graduate School Residential Conference, San Francisco, CA. The Source, Denita Benyshek, reverse-painted glass, 6'2"H x 22"W, private collection San Francisco, CA. Understanding the Gut Brain: Stress, Appetite, Digestion, and Mood, with Lisa Goehler, Ph.D., Associate Professor of Nursing Research, Neuroimmunology and Behavior at the Center for for the Study of Complementary Therapies at University of Virginia. Seminar offered through Institute for Brain Potential. The World of Stories & Symbols: The EMDR-Sandtray Protocol with Children and Adolescents, Ana M. Gomez, Phoenix, AZ. Neuroendocrine Approach to Anxiety and Depression: A Practical Approach to Salivary Testing. Brandy Webb, ND, DiagnosTechs. Sexual Addiction, Continuing Medical Education, Sacramento, CA. EMDR I and II (Eye Movement Desensitization and Reprocessing), an integrative neurological-cognitive mind/body treatment for trauma, chronic pain, and negative past experiences through bilateral brain stimulation. Pain management at the Pain Rehabilitation Clinic, Mayo Clinic, Rochester, MN (3 weeks). Personal Mythology and Dreamwork, Stanley Krippner, Ph.D., Association for Humanistic Psychology. Healing and Transformation: Traditional Belief and Healing Systems in a Changing World, an Interdisciplinary Approach, Society for the Study of Shamanism, San Rafael, CA. Career Transitions in Challenging Times, Susan Burns, MA, Association for Humanistic Psychology. Wisdom of our Ancestors: Bridge to the Future, 27th International Conference on Shamanism and Alternative Forms of Healing, Society for the Study of Shamanism, San Rafael, CA. Imagery and Healing: Tools for Healthcare, Jeanne Achterberg, Ph.D., Bastyr University, Kenmore, WA. Shamans of the 21st Century, Santa Sabina, San Rafael, CA. Water Ceremony with Mandaza Augustine Kandemwa, Bantu shaman from Africa. Sangoma healing practices, David Cumes, M.D. Clinical Implications for Serving People of Color, Washington Department of Social and Health Services, Olympia, WA. Skill Building for Cultural Competence, Truc Nguyen, Minority Executive Directors Coalition, Seattle, WA. Minority Youth, Kenneth Harding, Federal Way Youth and Family Services, WA. Jungian Psychology, Carl Jung Society, Seattle, WA. Pilchuck Glass School, Stanwood, WA. Jazz Vocal Class with Katie King, Seattle Central College Continuing Education. Modern Dance (Martha Graham and Bella Lewitsky Styles), Jazz Dance, Ballet, Wichita State University, KS. Keith Johnstone Acting Improvisation Techniques with Terrance Christgau.